SPRING FESTIVAL SEASON IS HERE! Find out where to enjoy the warm weather and live music with these awesome Ticket Alternative festival events! Celebrate the warm weather with Fiestas Fantasias, a 3-Day concert series held in Hemisfair Park in San Antonio, TX (April 24th-April 26th). This festival is brought to you by the San Antonio Parks Foundation, a 501 (c)(3) organization whose mission is to provide enhancements to the parks of the City of San Antonio and the County of Bexar which improve the quality of life for all of their citizens. Grab tickets to all 3 shows below or select your favorites! The fifth annual Atlanta Mess-Around Festival is coming! This is going to be an exciting weekend full of a variety of great bands you won’t want to miss. The two-day event kicks off Friday, April 26 in East Atlanta Village at 529 and ends Sunday at the Earl. Featuring performances by: Dwight Twilley, The Zeros, The Middle Class, The Go, The Parting Gifts, Natural Child Family Band and more! Check the official website for the full line-up and performance locations and times. Single day & full weekend passes available! It’s that time of year again! Time to fill your plate and belly with lip smackin’ crawfish and grab a cold beer to wash those suckers down. 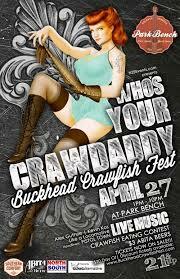 Join us at Park Bench in Buckhead on Saturday April 27 for Atlanta’s best Crawfish Festival! The crawfish will start boilin’ at 1 p.m. and will go until every last one is gone. Live music also starts at 1 p.m. and the party will roll through the evening, rain or shine! Grab your friends and come out for great food and a good time. Think you can eat more crawfish than anyone else?! Enter into the Crawfish Eating contest… Winner takes home a prize and trophy! $12 discount tickets are available now! Paid entry includes one order of Crawfish Boil! 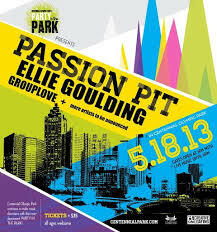 Tickets will increase to $15 after April 21. Tickets will be $20 on the day of the event! Live music lineup includes: Pistol Town, Alex Guthrie, Like a Locomotive & Kevin Kos. Plus more acts to come! Kick back and sip on a unique selection of 70+ speciality beers at the 3rd annual Heritage Sandy Springs Beer Fest! Admission is $30 in advance or $40 at the door and includes a commemorative pint glass and $5 food voucher. All the proceeds will go to Heritage Sandy Springs, a 501(c)(3) non-profit organization. The 3rd annual Heritage Sandy Springs Beer Fest is set for Saturday, April 27, 2013, 2 – 6 p.m. Enjoy a gorgeous afternoon of great beer, live music, speciality food on stunning Heritage Green! You must be 21 or older to attend. No outside food or beverage is allowed. Pets and smoking are not allowed. For directions and parking information, visit the official website. Want to spend a weekend on a beautiful, 100-acre farm in southeast Georgia listening to grass roots music with your closest family and friends? Hoopee Jam 3 on Friday May 3rd and Saturday the 4th, 2013, is the third running of the Hoopee Jam, a two-day grass roots music festival on a 100-acre private farm in Norristown in southeast Georgia. and… it’s BYOB! Performers for Hoopee Jam 3 include Mike Farris, Wet Willie, Col. Bruce Hampton, Jeff Sipe Trio, Randall Bramblett Band and more! Bring your family and friends to the Kingsport Farmers Market in Kingsport, Tennessee, on Saturday, May 18th from noon until 11:00 p.m. for a grand ol’ time! For those who are of age, you can enjoy the Craft Beer Tasting from 2:00 p.m. until 7:00 p.m.! Racks features a craft beer sampling, barbeque ribs cook-off (and tasting! ), a full day of incredible live music, plus vendors and activities for the whole family. Come see what 9,500 of your closest friends are talking about! Tickets are available now! They are discounted to $30 if you buy them before May 1st and $35 on May 1st and after. Tickets WILL sell-out as they have 5 years in a row so please order yours today. This ticket gets you access to the area’s biggest and best craft beer sampling AS WELL AS the big concert series featuring Diamond Rio, Webb Wilder, Mac Arnold, Benny Wilson and more! For more information, please visit the official Racks by the Tracks website. Calling all Country Music fans! Rome River Jam on Saturday, May 18th is a one day country music festival featuring headliners – Craig Morgan, Blackberry Smoke, Ashley Monroe, and Angie Johnson! Angie Johnson – 4:00 p.m.
Ashley Monroe – 5:30 p.m.
Blackberry Smoke – 7:00 p.m.
Craig Morgan – 9:30 p.m.
Ethan and Uri Wurtzel, owners of Twain’s Billiards and Tap in Decatur, make a point to find ways to support their community and in 2009 with the help of Bang! Arts Management and Promotions they created SpringFest, a music festival/event fundraiser to help give back to those in need. 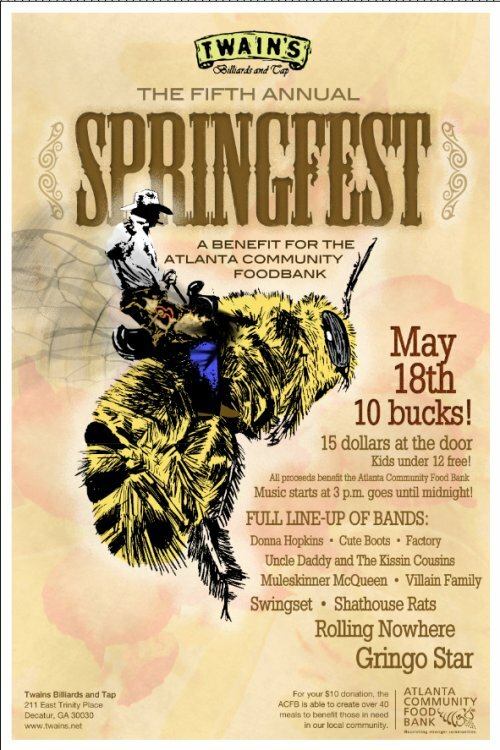 On Saturday, May 18th Twain’s will host the fifth annual SpringFest, benefiting the Atlanta Community Food Bank (ACFB). The day kicks off with bands playing from 3:00 p.m. until midnight. This year’s line-up includes local Atlanta favorites: Gringo Star, Rolling Nowhere, Shathouse Rats, Uncle Daddy and The Kissin Cousins, Swingset & more! Doors will open at 2:30 p.m. and the festivities will begin at 3 p.m.
Tickets are just $10 in advance and $15 at the door. Kids aged 12 and under are FREE! 100% of the proceeds will help the Food Bank and its more than 600 partner agencies feed those who struggle to put food on their tables. The ACFB has already distributed 21% percent more food and grocery products to its partners this fiscal year, which began in July 2012.